Double the Love! Adopt This Cat Bromance Couple. Disco the “tuxedo” cat and Sven the dressed up tabby, — this is the story of a cat bromance that began at the Safe Haven for Animals shelter. At the confident age of six, Sven is the “older man” in this May-December relationship. Sven has the classic markings of a mackerel tabby: brown, black, and grey. Notice the mackerel tabby “M” marking on his beautiful forehead. (We think it stands for “More” — as in More love, More purrs, More playtime!). He’s always dressed for success with his white tuxedo marking under his chin, and on his chest and throat. (Yes, that spot is as soft and silky as it looks in his photo.) And we can’t forget his “white glove” paws, ready for any formal event! In 2016, Sven came to Safe Haven with a beautiful black cat. They’d been going it alone on the streets of Scottsdale. Sven and and his friend found Save Haven, where they were able to rest and eat regularly, finally. One day Sven's friend went to a new home and Sven found himself alone; but at least he was safe and comfortable at the Safe Haven house (a free roaming home for cats). Around the same time Sven was resting up at Safe Haven, Disco was rescued with his five littermate brothers and sisters (they were about two months old). They’d all come from an overcrowded shelter in downtown Phoenix. It took a few weeks but they all thrived in the open rooms of Safe Haven. They wrestled and played, purred and slept, and grew in their confidence and curiosity. One-by-one Disco’s family was adopted out until he was the last one left. We’re not sure, but we think the reason Disco was the last one left of the litter is that he’d already decided he wanted to be with Sven. They hunt (play) together in the main room of the Save Haven house. They both love to jump and flip in the air when chasing “DaBird.” They both run on the “One Fast Cat” cat exercise wheel. They’ll spring from the top of a cat tree on one side of the room and race across the room to the top of another cat tree on the opposite side. They have the speed of a cheetah (ok maybe not quite that fast, but pretty fast!). When playtime is done, they lounge and sleep and purr together. They’ve bonded in a way many of us yearn for — they’re forever friends! Are YOU their forever family? 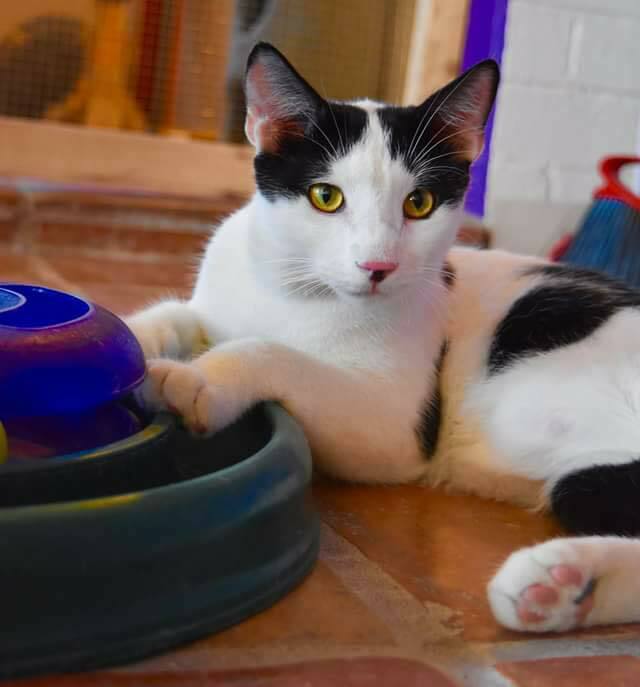 Sven and Disco need a home with space to run and play, lots of toys and cat trees (and if you can… a cat exercise wheel). Favorite toys include string wands, laser pointers and bouncy rubber balls. You will never get bored of their playtime antics and in-air flips! It’s more than fun and games with these two; there’s some serious downtime with purrs, paw kneading, and full surrender belly exposure too! All the volunteers at Safe Haven adore Sven and Disco; we want to see them in a home together where their bromance can continue, and their abundant love can be shared with their human family. At Safe Haven we help you through the adoption process with a home-visit, counseling on new pet introductions to family and other pet family members, and we are there for you if you have questions (and we love to share pictures of our cats happy in their new homes). Our cat family members are spade/neutered and micro-chipped and we provide their vet medical records to you. Our adoption fees are $89 per cat and we ask that all adopted cats remain indoor cats.